Hey y'all! Spring is finally here in North Carolina... perfect temperatures, random rain showers, gorgeous flowers, and a giant fog of pollen. Yep, it's definitely spring! Besides the pollen, I really love springtime. I say it's my favorite until the refreshing coolness of fall rolls around after a sweaty, crazy humid summer season. I guess I just really love the renewal that spring and fall bring. It feels like a new beginning and that's always nice. Spring also brings sandals, dresses, shorts, and skirts! I don't wear many dresses or skirts during the winter because I get too cold and I don't like tights. I'm always excited this time of year to wear them again! 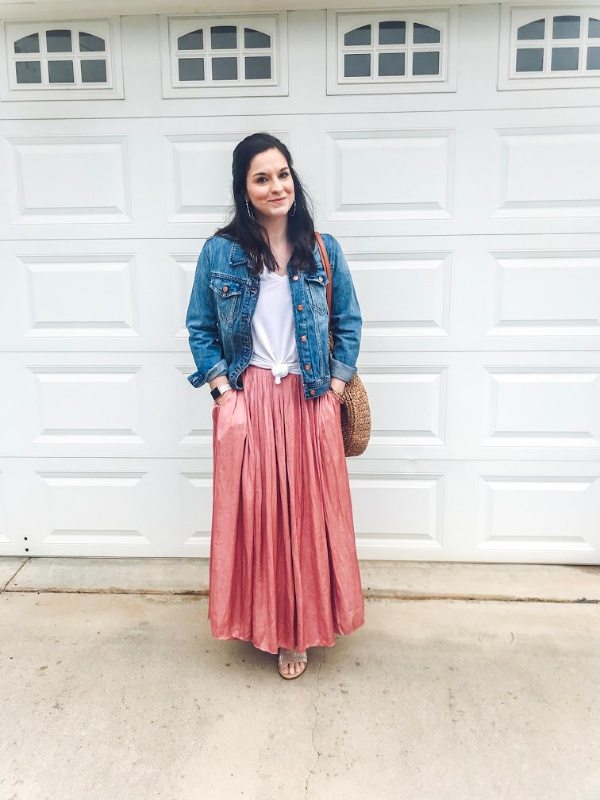 My overall style is pretty casual so I usually stick with denim skirts or a t-shirt dresses (like I shared in my go-to spring outfit). 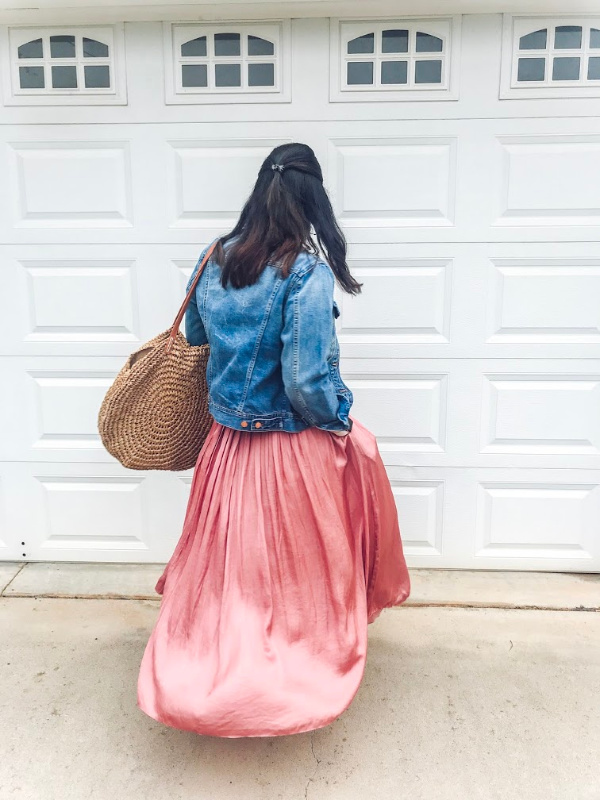 But, when I saw this gorgeous skirt, I knew I needed I had to have it! It's like nothing I already own! I thought I could make it work for a casual outfit because it has pockets. I always feel comfortable (and happier) when there's pockets! Anyone else find comfort in pockets?! 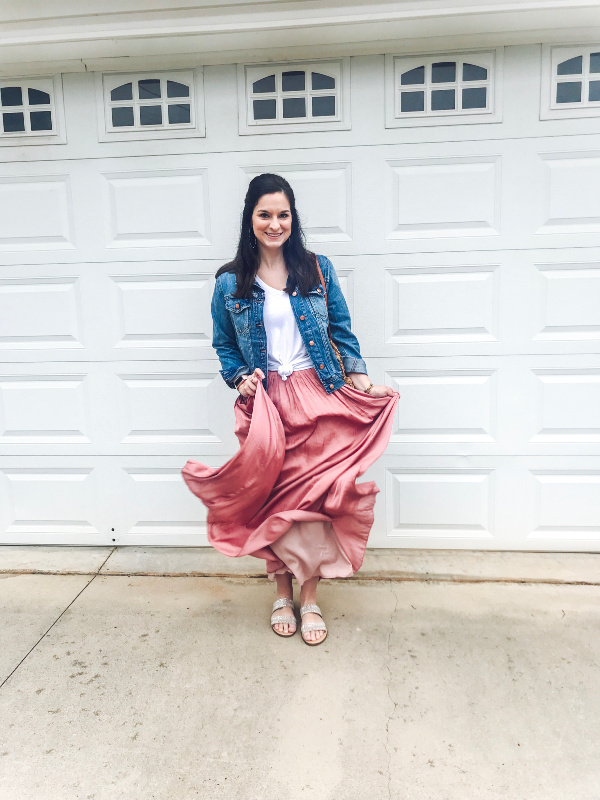 This skirt is also machine washable which totally fits my lifestyle as well! 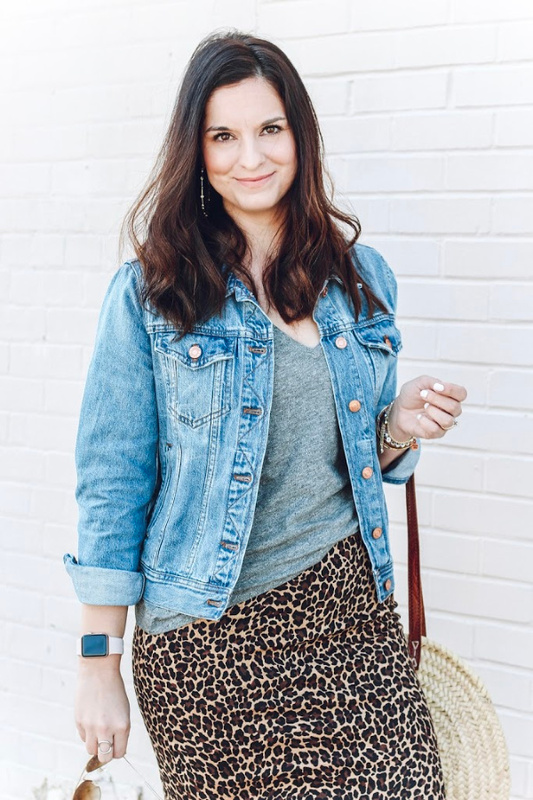 I found that when I started styling this skirt, that I was able to come up with so many fun, casual options! The way I chose for this look is an outfit formula that I use very often in the springtime: denim jacket and white tee. 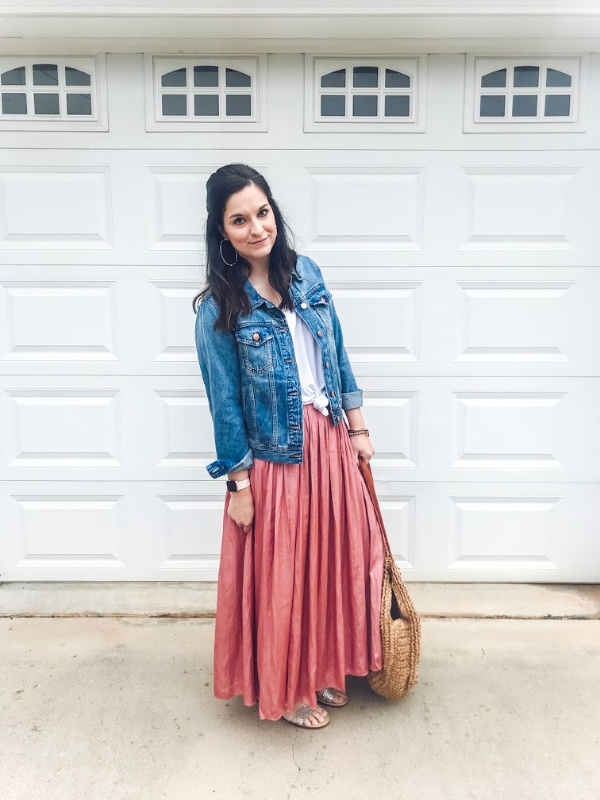 I feel very comfortable in those classic pieces so it's a great starting point when styling a new item, especially something like this skirt that already makes quite the statement on it's own. It's also a great outfit formula when you are wearing a print on the bottom, such as a plaid skirt or polka dot shorts. The denim jacket and white tee instantly make an outfit look more casual while keeping the look put together. I just feel like it really balances a look so well! 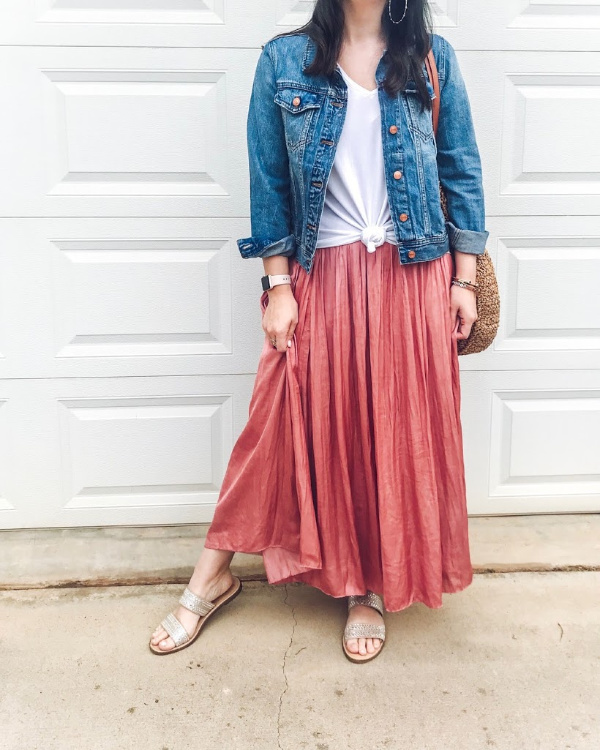 I chose slide sandals for this particular look because I was headed to serve at church but I think this exact outfit would look adorable with a pair of white Converse sneakers too. Just swap the sandals for sneakers for a whole different look! 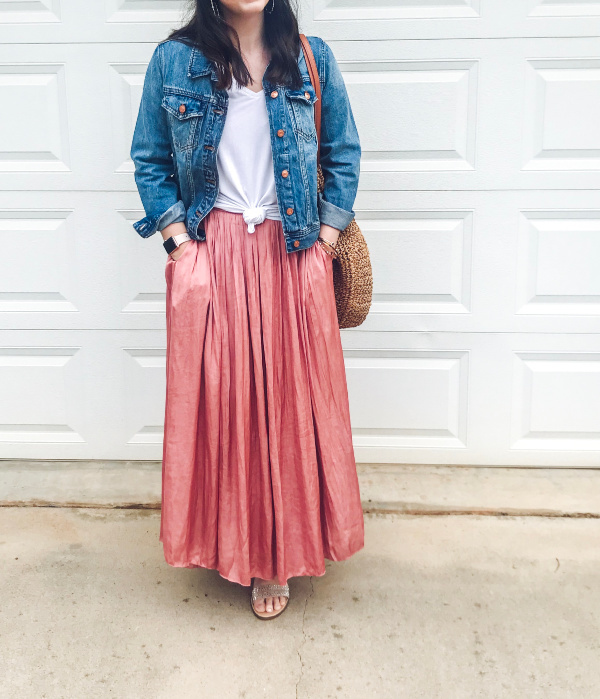 You could totally dress this skirt up and make it extra fancy for a special occasion but I just really love that I can feel fancy in my everyday life, without sacrificing comfort. We all deserve to feel fancy (and princess like) on our own terms!